Rufus & Coco 2in1 Natural Wash is a professionally formulated, pH-balanced mild shampoo and conditioner for dogs and cats. First, get your little mate all wet with warm water. Now apply some of Rufus & Coco's 2in1 Natural Wash to a few different areas of the coat, and massage it in to get a really good lather going. Then simply rinse and towel-dry. 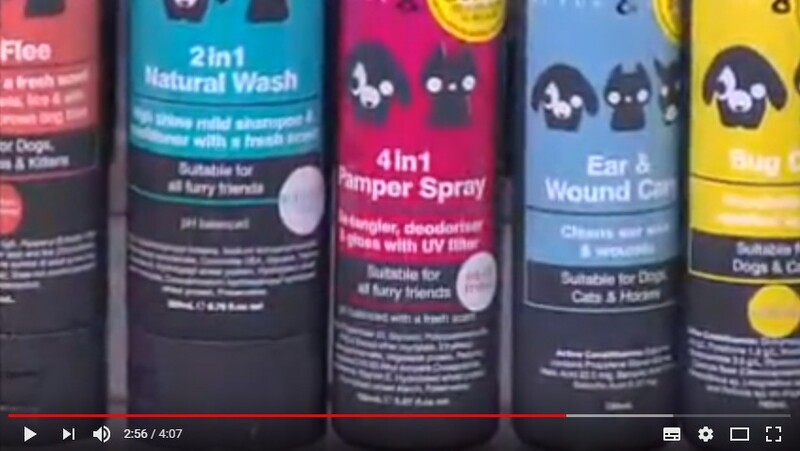 Do this whenever they need a wash, and use Rufus & Coco 4in1 Pamper Spray after or between washes for the very best results. Sodium Lauryl Sulfate (SLS) : Sulfate is a harsh (caustic) detergent that can damage the outer layer of the skin causing dryness, roughness, scaliness, fissuring, loss of flexibility and reduction of the barrier functions of normal healthy skin. Q. Why is using soap in pet shampoos a bad idea? A. Because using soap in a dog wash will affect their skin as their acid layer of their skin will be disrupted. This can create an environment where bacteria, parasites, and viruses can breed out of control! Unknowingly, many pet owners may repeat washing of their dogs because of the smell caused by a proliferation of bacteria, making the problem worse as the skin's acid layer (pH level) becomes more imbalanced. Additionally, if the shampoo makes the skin feel dry, your dog will scratch at its skin, creating abrasions for bacteria to invade. It quickly becomes a vicious cycle. None of the Rufus & Coco washes (shampoos) contain soap. Rufus & Coco products use a natural base and formulation specifically designed to the average pH of a dog. Consider that the normal range of skin pH levels for humans is 5.2 to 6.2, which means it tends to be on the acidic side, whereas the pH levels for dogs range from 5.5 to 7.5, tending toward a more alkaline concentration. Hence we never recommend using human shampoos on dogs and we eliminate the soap all together in our dog washes. Many humans choose soap free alternatives too for the same reason! It is also worth noting that Rufus & Coco washes also contain a hypoallergenic fresh scent.